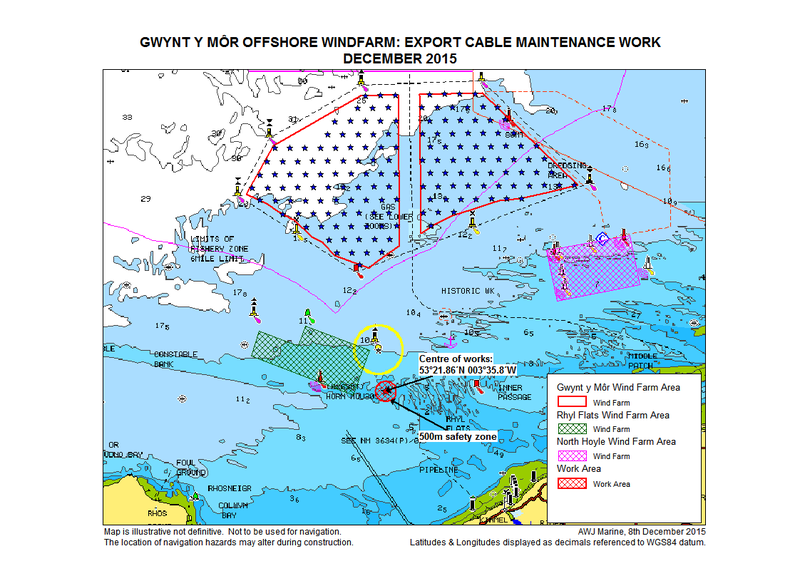 Mariners are advised that cable maintenance works are due to be carried out on the export cable from the Gwynt y Môr Offshore windfarm starting on or around the 6th December 2015. A Notice to Mariners has been issued in connection with these works. This notice can be downloaded here and is summarised below. The vessel Stemat Spirit is due to be carrying out cable maintenance works at the approximate position 53° 21.86’N 003° 35.8’W. This location is shown on a map that can be downloaded here. Information about the vessel involved in this operation, including the call sign and a link to the vessel details on Marine Traffic is given below. All vessel traffic is asked to keep at least 500m clear of the vessel when it is engaged in operations. The vessel can be contacted on VHF Channel 16 at all times. Fishermen should be aware there may be occasions when sea bed cables will remain unburied and unprotected on the sea bed [within the boundaries of the wind farm] and to this end they should keep in touch with the Marine Coordination centre for the wind farm on 01793 893438 or mob 07827244495 and VHF16.